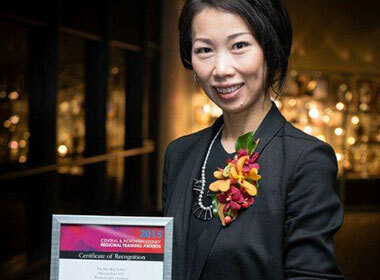 Born and raised in Yokohama, Gyoka Yau Okina exemplifies the type of alumna Le Cordon Bleu Australia has come to expect. Raised to follow her instincts, Gyoka may look shy and reserved but is actually a bold and daring character with her decision to travel to Australia depicting such a personality. Prior to coming to Australia, Gyoka worked in the fashion industry, graduating from university in New York with a bachelor’s degree in ‘Fashion Merchandising and Management’. After her studies in America she was introduced to the joy of surfing, upon which the idea of going to Australia to learn surfing captured her imagination. 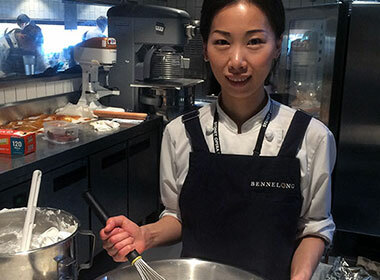 After a year in Sydney she returned to Japan where she started her Le Cordon Bleu training, but her love of Australia and the comprehensive training programs available brought her back. Having lived and studied in Japan, USA and Australia, Gyoka considers the education and training system in Australia to be one of the best. While studying a Diplôme Avance de Gestion Culinaire (Advanced Diploma of Hospitlaity) was at times challenging for Gyoka, with extensive hours in the kitchen and working under pressure in an extreme environment, she quickly found her feet. By the time she graduated she was awarded the International Student of the Year at North Sydney Institute 2015 Excellence Awards, an incredible achievement.